Ever wondered how you could make a little cash on the side? Or how to sell t-shirts online? Well, who hasn’t? Whether you thought about selling your services on Fiverr or Washed cars around your neighbourhood everyone has thought long and hard about how to make that extra cash to comfortably get you to the next payday. Many people have flirted with the idea of selling t-shirts online and at events. Whether you’re thinking to yourself How do I sell t-shirts at events? Or how to make money selling t-shirts? Then this article is going let you know everything you need to know about the best methods to get started online. You don’t need to be a top graphic designer, have tons of amazing ideas or even money, you can still get started and potentially become successful online selling printed products through your own online business. Way back in 2010, at the ripe old age of 12 I started my own custom t-shirt printing business. For a 12 year old the company was fairly successful and I sold large amounts of t-shirts to different companies and even my school. 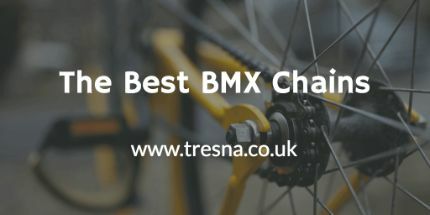 Moving on a few years I came up with and developed Tresna Clothing, A BMX and Skate clothing brand with a blog all about anything business, clothing, BMX or web related, and it’s starting to get bigger and bigger. Way back in 2010, at the ripe old age of 12, I started my own custom t-shirt printing business. For a 12-year-old the company was fairly successful and I sold large amounts of t-shirts to different companies and even my school. 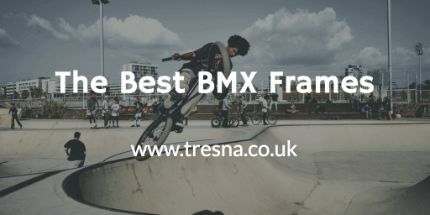 Moving on a few years I came up with and developed Tresna Clothing, A BMX and Skate clothing brand with a blog all about anything business, clothing, BMX or web related, and it’s starting to get bigger and bigger. I have never entirely relied on a t-shirt fulfilment business to keep Tresna running although I have used many of them. My clothing is primarily sold through PayPal buttons on this site whilst using sites like the ones listed below to get my product out to a different type of audience. To print the shirts and jumpers I sold I have used many different drop shipping services like www.inventclothing.com and also Clothes in Order to fulfil the larger orders. I have researched many different and have used methods such as vinyl heat transfers and screen printing for some shirts. All of these methods are hard when you don’t have a lot of experience and the right equipment but through persistence and luck, you will eventually succeed with a shirt. It’s all much easier once you have your printing method. Unlike many e-commerce stores, I didn’t go for the conventional shopping cart platform. This is because there is usually a monthly cost on these sites and my revenue wasn’t enough at that point to accommodate this. PayPal provided me with the simplest and safest form of taking payments from my site. It was extremely simple to integrate these buttons into my product pages and also to customise the look of the buttons. Unfortunately, if a customer wants to purchase more than one product they have to buy them both separately which discourages some customers. 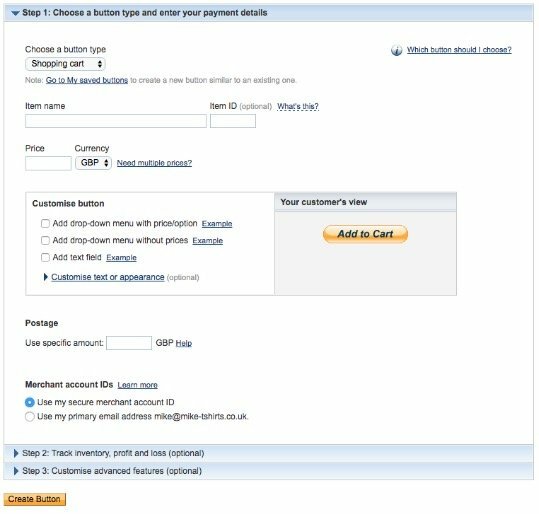 Several different payment tools are provided on www.paypal.com, these range from PayPal buttons up to a full express checkout that you can add to your site as another payment method. The express checkout is fully integrated into your site with a shopping cart system. PayPal’s express checkout is said to increase sales by up to 7.4% in just three simple clicks. The express checkout method does cost and also takes some time to incorporate into your site. 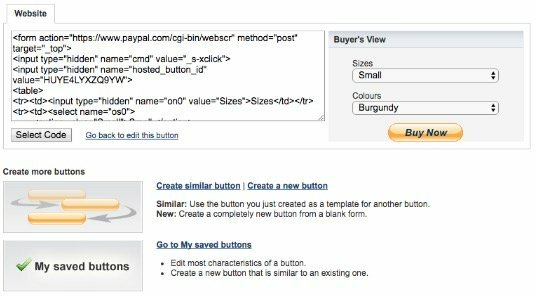 This is a step-by-step on how to add PayPal Buttons to your t-shirt store website. It almost goes without saying that you need a functional website and a PayPal account before you can do this. Whether you designed the site or you hired a web designer you’re going to need access to the code and a very basic understanding of how HTML works. Sites like Wordpress and Shopify can also accommodate these payment buttons although there are some sites and platforms that offer their own plugins that are specifically designed for selling t-shirts online. 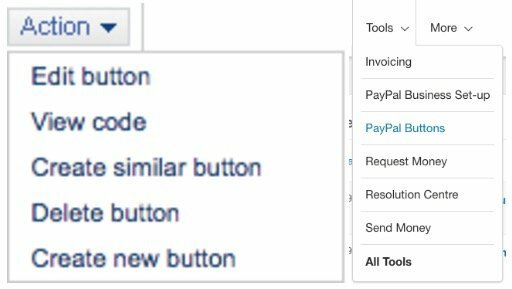 To find the buttons to implement you need to go to the “Tools” tab and click on “PayPal Buttons.” Simple right? You are then taken to a page that shows all the buttons you have created previously. There are two options for you at this point. a. If you have created buttons previously then you may know this but you can “create similar buttons” which creates an exact copy of your previous button and lets you change any simple stuff like the name of the product. To do this you need to click on “Action” and then “Create Similar Button.” This method is much easier than creating many buttons from scratch and it also helps make sure you have all the details the same on every page. b. To create a button from scratch you simply go to this section of the page (Pictured Above) and click on “Create new Button” and you will be taken to this page. The Section titled “Your Customer’s View” shows the default layout of the button and will change when you add different customisations. Don’t worry about the look of the default button as it can be changed simply with a little tweak of the code (Explained Later). After filling out this form, Step 2 and 3 you can click on “Create button”. After creating the button you will be taken to a page giving you a short step-by-step guide on how to implement the button and also the unique HTML code that you need. (this is pictured below.) From this screen, you can also quickly create a similar button to this one or make a new one. If you want to change the look of this button then you simply add a class to the button then declare it in your stylesheet and add then add your attributes. The class I have used is “... class=”button large expanded” though this is actually three different classes and they are all added for different reasons and aesthetics. Selling t-shirts through one of the many CrowdFunding sites out there is a method many people use to make and sell many things from t-shirts to accessories and phone cases. All the sites I am going to go through below are known to be some of the top sites to use when selling online. 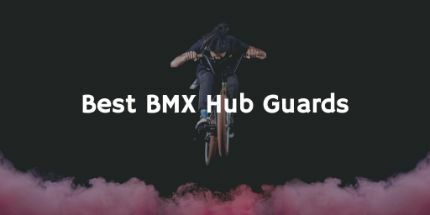 Some have more help through fulfilment than others, Some are crowdfunding sites where you need to sell a set amount within a set time to be able to get the shirts printed. Others are simply sites like eBay that are specifically designed for selling custom products. The reason these sites are loved so much is that there is no initial cost or major financial risk. No need to keep stock and no need to put a massive budget into creating a website. As soon as you launch a product or campaign it’s instantly possible for you to reach hundreds of thousands of visitors that are all looking for something to buy. TeeSpring was one of the first and still one of the best crowdfunding platforms for custom printed clothing. Founded in 2011, TeeSpring has sold over 19,000,000 products all over the world. An incredible 1 in 75 people purchased a product from teespring in the US in 2014. That’s an incredible statistic that makes it ever so more likely for your product to sell on this site. 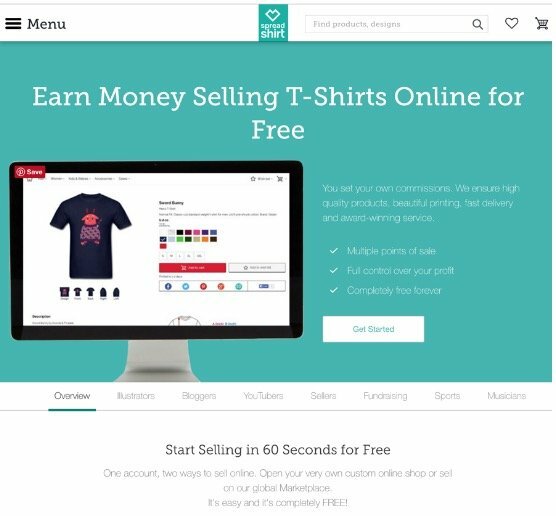 After creating an account at TeeSpring you are welcomed with this page showing products ordered, profit, to be paid and total donations. I have started a new account and have shown the campaigns page. I obviously currently have no profit and no sales because I have only just opened the account. Once creating a new campaign you are presented with this page. Nearly everything you need is provided on this page. You can choose the product, type of clothing, colours placement, designs. After deciding all the options on this page I Clicked the “Sell This” button. The next page lets you choose how many sales you expect to make and the price you are to make if you sell this amount of products within your campaign. You can change the price you sell the product for although obviously, you’re going to either make less of a profit or it’s going to be less likely someone will buy your product. The number of sales you choose will be the amount that must be sold before the allotted amount of time. If this figure is not reached then nothing will be printed and you will have to start again from scratch. It’s an artform deciding the number of t-shirts you expect to sell and the price you are going to sell them for. Charge too much and no one will want to spend that much, charge too little and you won’t be able to afford the advertising campaign you made to promote the shirts. Then you have to plan and optimise your adverts, usually Facebook, and it all gets very complicated. I’m going to run you through it all. After filling out details such as the title, description, campaign length and some other small details you can finally launch the campaign. As you can see in the image above I have set the aim of selling 3 t-shirts over the course of 21 days. The process of launching this campaign has been relatively simple, though the point of these sites is to make it as simple as possible. The harder part comes when you need to actually get some shirts to sell and to do that people usually use Facebook advertising. This is explained in detail later in the post. 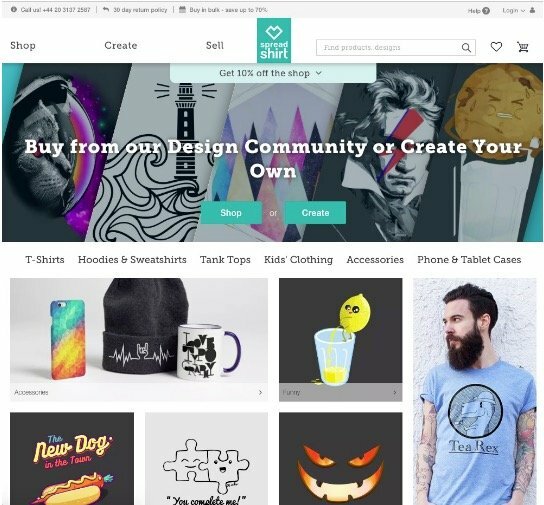 Unlike Teespring, Zazzle isn’t a crowdfunding site so you don’t need to advertise your products for a certain amount of time and hope for a set number of sales, instead, you can launch your products and let their users purchase when they like. 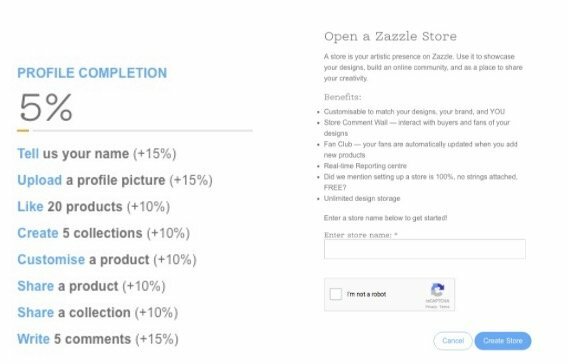 After creating an account with Zazzle you are obviously presented with the welcome screen and also a profile completion section (Shown below). I like this section because it doesn’t force you to complete all your information at one time. I see this as more of a target to help your profile get to a professional state faster. This page is for every member so if you’re looking to sell products then you will need to go to the “Sell” function on the navigation bar and then “Create a store”. Zazzle offers two types of stores. You can either sell as an associate or as a designer. 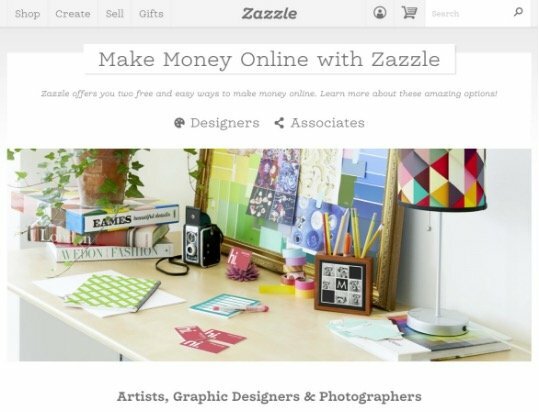 Selling as an associate means you promote products that are already for sale on Zazzle, doing so can earn you 15% per sale and bonuses depending on volume sold. If you own a website and are looking for an extra bit of revenue without having to plan, design, market and sell a product then This could be very useful as you can choose any page to promote meaning there’s definitely something for every niche. Selling as a designer is basically the opposite of an associate. If you love t-shirt design but hate the boring job of having to fulfil orders, complaints, returns, a website and so on then selling on Zazzle could help. All you do is design things. Whatever you love and then upload it to the site. Instant possibilities of reaching millions of people that already trust the site. Selling this way can be harder than an associate but you decide how much you make on every sale from 5% - 99%. Spreadshirt is without a doubt one of the industry leaders in t-shirt crowdfunding and t-shirt selling online. They have many different aspects of their site and every part is well put together. Whether the user is a graphic designer trying to sell some designs for extra cash on the side or a mother looking for a Christmas present, the site seems friendly to all, with a very easy to use interface making navigation easy whilst still providing all the information needed on every page. From simply looking at the home page you can see that both the designer and the customer are equally important to the company. They showcase many great designers’ work on the homepage, helping them along the way to more sales but they are also categorising everything brilliantly that eliminates every doubt that the user has about clicking on a certain link. 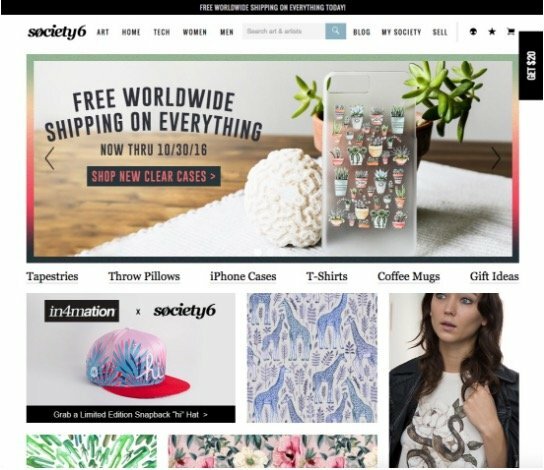 Other websites focus on simply getting a sale. They don’t appreciate the designers that actually bring the users and the revenue. Creating a store couldn’t be more simple on Spreadshirt. You simply click the “Sell” button on the navigation bar and you will be presented with the page shown below. Everything is simple and free. You’re in control of almost everything, even the amount of commission you earn on each product. 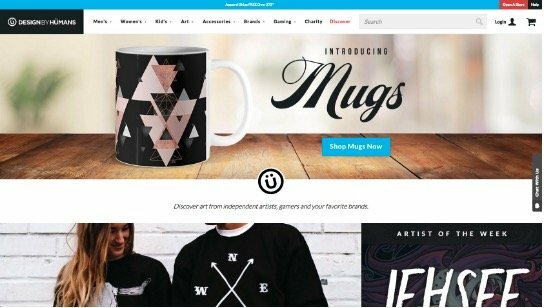 Spreadshirt isn’t just for designers either; it’s a great platform for Illustrators, Bloggers, YouTubers, Athletes and even Musicians. After creating a store on the site you are directed to edit all settings of your newly created store. This is the part that is most confusing simply because there are so many different things you can edit and do. After creating a shop on the site the obvious next step is to create a product to sell. After designing or purchasing your ideal design you need to upload it to the site. 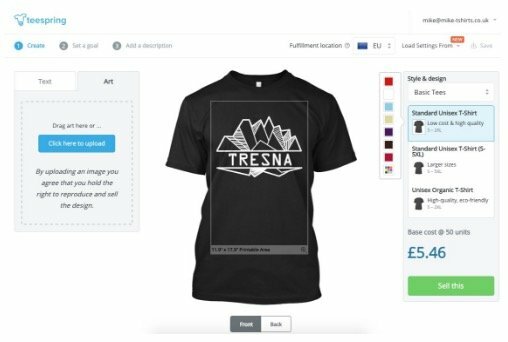 Whilst you are creating the product, writing the description and so on Spreadshirt are checking over the design to ensure your design adheres to copyright laws among other things. Confirmation time varies but you will receive an email telling you that your design is ready to sell. After receiving this confirmation you can proceed to launch your product for sale. Another element of Spreadshirt that works brilliantly is that when you upload a design it isn’t just for one product. All your uploaded clothing designs are congregated in one place on your account and simply clicking on one button will allow you to make a product with that design. 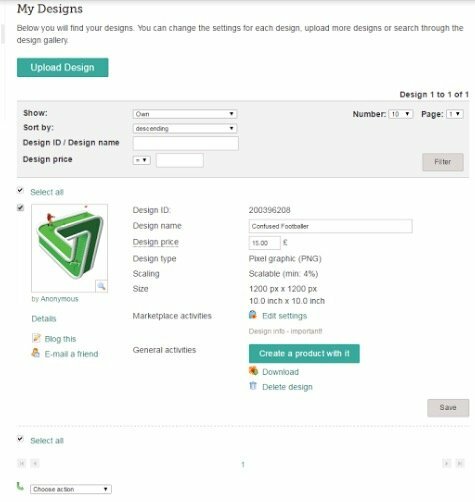 The image below shows the layout of the page holding your designs. For this example, I designed a white men's t-shirt on the t-shirt designer. After you are finished your product design it’s time to add choose what you want to do with the product. For this example, I am going to add my product to the Marketplace and to my Shop. Adding it to your shop couldn’t be more simple. All you have to do is decide on the shop you want to add it to and then click “Add”. Publishing your product requires you to add a title, description and add tags, not a big deal but essential to get right if you want your product to be seen by more than 10 people. Almost like search engine optimisation but for Spreadshirt. After this everything is very simple, you will be alerted when your product is sold, you couldn’t ask for more helpful information about your customers and products. Spreadshirt even provides a downloadable Google calendar showing the promotions to be on offer in the future. "By Tee People, For Tee People"
Out of the whole list, this is by far one of the best layouts. The above-the-fold content features large blocks of content with a nav bar so simple it could be used by anyone. Lookbook images and new products make up the rest of the top section of the page, scrolling down the page shows some amazing designs created by the site's users. These designs are extremely different from one another but all clearly have the same great goal in mind. Uploading designs and registering as a designer has been made a simple undertaking too. "Design It, Upload It, Promote It" is the motto on the designer's page. 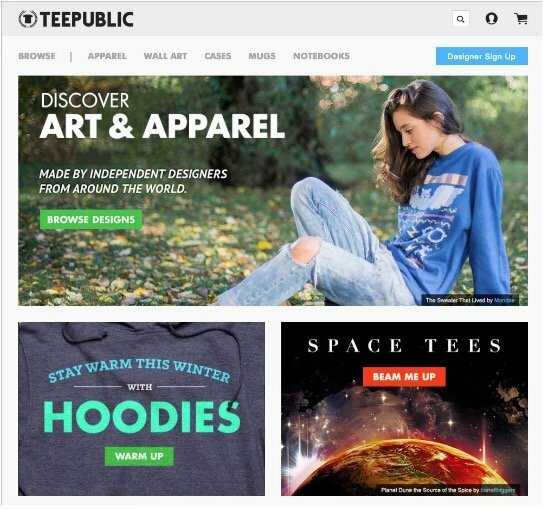 Unlike Spreadshirt, Teepublic is clearly targeting designers closely related to marketing and advertising. You aren’t overloaded with options and extras all over the place. You simply design something, upload it to their site, choose the colours and products and then go away and market it the best you can and hopefully get some extra cash. Let’s talk numbers! Just like 90% of the other sites in this market you are paid on commission for your designs. Your t-shirt is offered for sale at $14 for the first 72 hours and you will receive $2 commission on every sale within this time. After those first 3 days, your commission will go up to $4 per sale. The only other fluctuation is when Teepublic has a site-wide sale every month where you earn $2 commission during this time. The last great thing is that if you refer someone to the site, you also earn $1 for every sale they make. 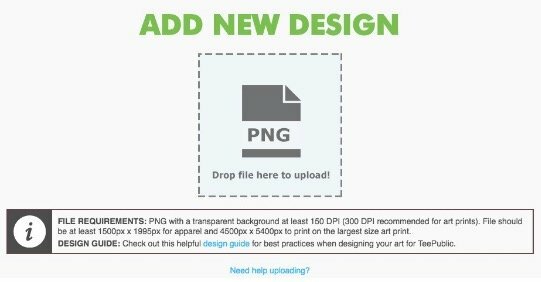 A PNG file is needed for a design as there’s no background and therefore makes it much easier to print. You also need to have at least 150 DPI and at least 1500 x 1995 px. You’re even provided with a design guide that teaches you about printing methods, graphics showing the best colours in hex codes and even diagrams of how the garment will be printed. Redbubble has a similar layout to TeePublic, although a little more complicated; though you can tell there are many more options on this site. The site is very diverse with over 3.5 million designs from over 350 thousand designers that design and sell every type of image you can think of. Unlike the more simple TeePublic, you can actually choose your own royalty on RedBubble. Some people prefer not to have this option as it doesn’t let the design do all the talking. If every price is the same then people have to choose the product solely based on the design printed. A commission rate of approximately 20% will give you between $3 and $10 depending on what you decide to sell. There is extensive customisation available on Redbubble. You are provided with a shop and a portfolio. Here you can then update details, layouts, banner images, logos, prices and much more. The difference between your shop and portfolio may be obvious but if not the images below show the difference. I think Redbubble is the most alike to running a standalone t-shirt company. You manage your own shop as though it’s a site and can add journal posts, scheduled release date and upload to your portfolio. If you are thinking of selling on Redbubble make sure that you’ve already saved your files as HiRes files at a large size. If you save a small image then your image won’t upload properly to Redbubble and your image will be distorted if it is enlarged. Design by Humans seems to take a lot of graphical design influence. The theme throughout the site is efficient and simple. DBH is one of the more upper-class sites to sell your designs and because of this, you need to apply and get accepted before you can do so. The application process isn’t as strict as you may think, applications usually take about 24 hours to be accepted and then you are set free to open your shop and start selling your designs. 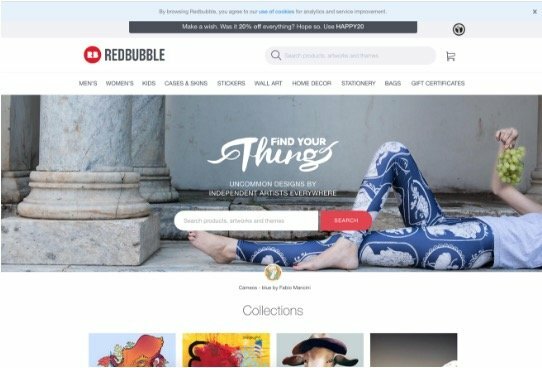 Just like Redbubble, you are provided with a store to add your logo, banner images and products. As well as a personal store you also get access to a dashboard, and resources (Dashboard showed below). 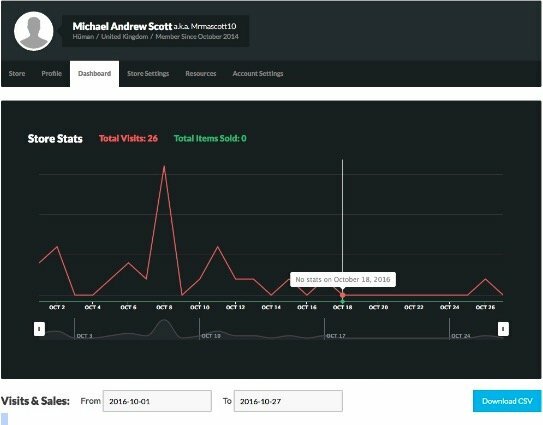 Your sales, royalties and other details are shown on your dashboard. You can also see the statistics of your store by navigating through the dashboard and seeing how your total visits marry up to your sales on each product over time. So the most important thing most people? The royalties! Selling a t-shirt will earn you $3 and sweatshirts will earn you $4.50. Printing quality sizes up to 6XL and worldwide shipping is all great things offered by Neatoshop. 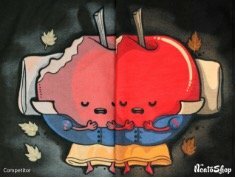 The image you can see below is the side-by-side comparison of a print from Neatoshop’s main competitors against their own. If this is accurate then it looks like they have some of the best prints on the market. The homepage and the layout of the site aren’t as brilliant as some of the other sites, you may not always realise you’re actually on the home page. With that said, the designs submitted by the designers look amazing. 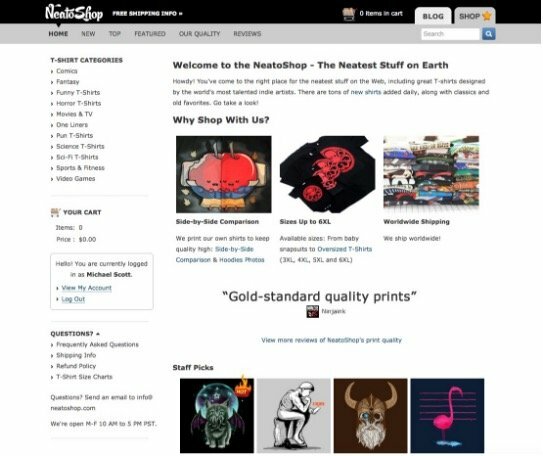 Unfortunately, to be able to sell your products on Neatoshop you can’t just sign up for an artist account and start selling. If you want to sell your products here then you need to email the staff and request an account. Along with your request, you need to show a portfolio of your work. This could be through your Behance account or a personal portfolio site. If the moderators like your stuff then you will be accepted and provided with an account. It’s definitely harder to get accepted onto this site but your prints will certainly be better than other sites although your royalties are practically the same as most other sites at $3 per shirt. Advertising your product is almost as important as making a design to sell. On many of the sites listed above your product isn’t likely to be seen unless you drive visitors from other avenues. Advertising comes in many forms from massive corporations like Nike advertising in some of the biggest spots of the year to put up some small posters around your hometown. There are many different reasons why you should and shouldn’t use certain forms of advertising. For starters there’s no point launching a huge TV campaign to sell a couple of t-shirts; the cost will be far too much and it’s very hard to reach the right demographic. On the other hand, if you go around putting up posters and flyers trying to direct people to your website you aren’t going to have much luck either. Although you can do this pretty cheaply it’ll still be extremely time-consuming to reach the number of people you need to get a positive outcome. The best way to advertise t-shirts online is usually through social media adverts. Each and every campaign should be done differently and a duplicate advert shouldn't be used for multiple products. This is just lazy and things like demographics and placement need to be different every time. Advertising on Facebook is usually good for most campaigns simply due to the sheer number of people using the site you can target 95% of markets. Since Instagram is now owned by Facebook it’s even easier to advertise on both. Instagram adverts are great at the moment. They have only just been introduced and are also modelled to look exactly like an image being posted by a regular user. This coupled with the fact that Instagram ads haven’t become annoying and overused yet means that the CTR will be great for your company. Google Adwords! 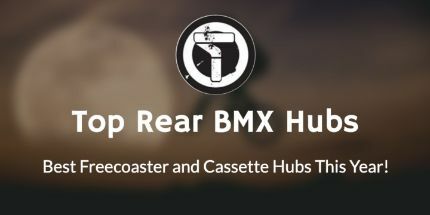 An amazing site that helps not just advertisers but the general business user for everything from keyword research to submitting an ad for your new product. The features of Google AdWords can’t be beaten and there’s no better way to target the right audience. Your ads are simply placed at the top of search results of the keywords you’re targeting. The downside to using Google AdWords is the cost. If you’ve only got a week-long campaign you could spend £5 a day and still not sell a single shirt. If you’ve paid for artists to design you a design then you may lose more money than you make until you get the hang of it. Decide on the products to sell early. Make sure you know what products you want to sell early. Don’t just choose the product when you get to that stage on the campaign process. Style of t-shirt. You also want to decide on the style of garment you are going to sell. Including the colour and fit. This all should be done before you even design the artwork. Artwork can look different and even distort when it is printed on a different material or fit. Who will design your stuff? Obviously, not everyone is a veteran graphic designer and you may need to outsource some design work to freelance designers or competition style sites where many people compete to sell you their personally designed artwork. There are other sites that you can purchase previously designed artwork. These sites are cheaper but definitely trickier to find a design that fits your needs and target market. Where to sell your products. You may know how to code and want to sell your products on your own website or you may want to sell it on websites like the ones described above, you may want to just sell at events or sell in a pop-up shop. You need to decide on the place early on so that you can cater for this when you’re designing all aspects of your business. Pinterest Ideas. For may businesses Pinterest is a godsend and often generates the most leads and traffic to your site. Logo. Either design a logo yourself or hire a freelance designer to design you a logo for your brand. 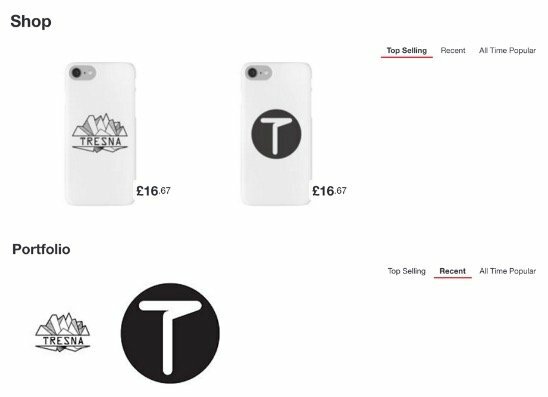 Wherever you decide to sell your products a logo is very important and should be placed wherever your products are so people start to recognise your brand. Moodboard. When creating new designs mood boards can never be a bad thing. A mood board is simply a page with images that in some way link to the idea that you are creating. Designers love mood boards so they know much more about what you’re wanting and they don’t have to interpret what you’re wanting just from a brief. T-shirt templates and mockups. If you can’t afford to print the designs and then get them photographed then the easiest thing to do is download a mock-up and simply place your design on that. Some mockups are so good that it looks just like you photographed a real shirt anyway. Most of the sites listed above automatically mockup your designs on your chosen garments. If it goes well consider selling to clothing stores.selling to clothing stores can either be very successful or very difficult.